Whitehead and Russell wrote the Principia Mathematica. 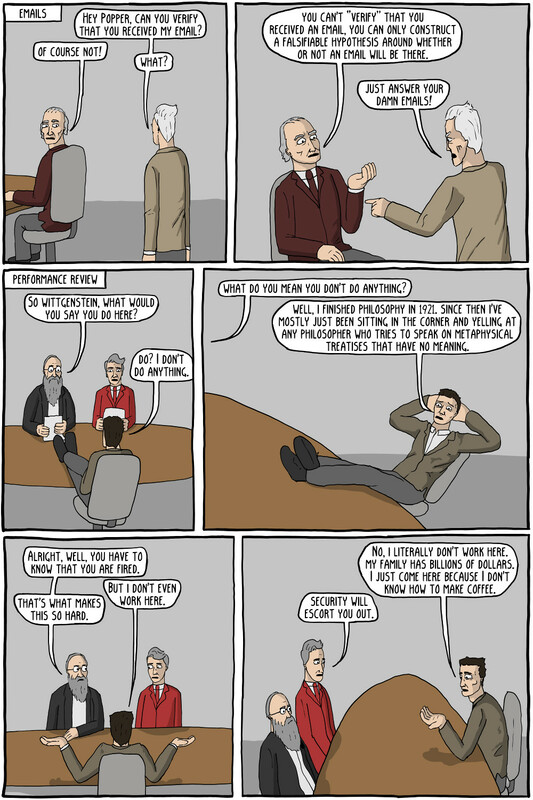 The joke is based around the fact that analytic philosophers have a stereotype of trying to reduce everything to small, easily analyzable concepts, which can lose a grander or more profound meaning. Carnap and the Vienna positivists believed that anything that wasn't subject to empirical study was "nonsense" (meaning literally without sense, and thus could not be discussed). Bertrand Russell had his share of divorces. Quine believed there was no clear split between science and philosophy, as all empirical study relies on a worldview that allows the scientist to interpret and frame the observations that he is studying. 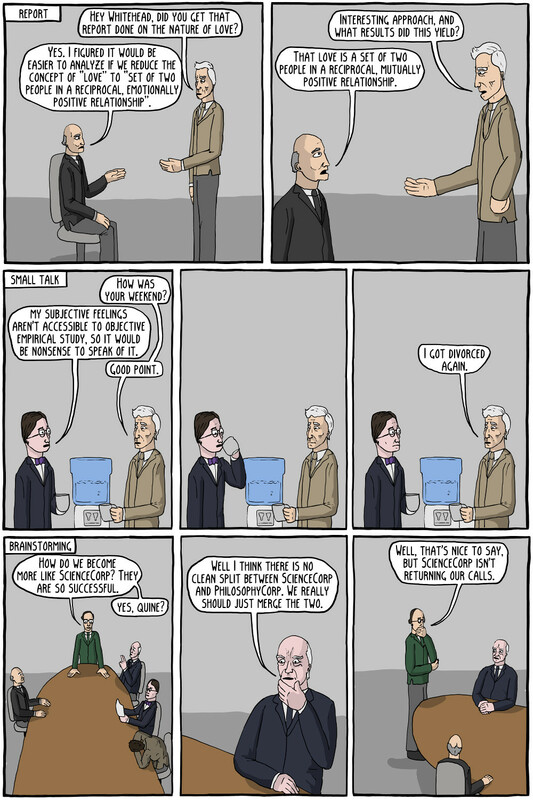 Analytic philosophers in general are pretty envious of science. To be fair to them though, science is pretty awesome. The leader of the meeting is J.L. Austin, an important philosopher of language. Karl Popper is an extremely important philosopher of science, who helped end the kind of positivism proposed by people like Carnap. He said that scientists, in fact, do not verify anything. Instead they construct testable hypotheses that are able to be falsified. So when a test is successful, the theory is not verified to be true, but only not shown to be false at this time. Wittgenstein claimed to have "finished philosophy" in 1921 when he published the Tractatus Logico-Philosophicus. He said the only thing left to do was sit in the corner of lecture halls and yell at philosophers who overstepped the bounds of what could be spoken about (essentially things that could be empirically observed). Metaphysics and ethics, for example, fell into this category. The two reviewers are Robert Nozick and Robert Brandom, chosen merely for their names (after "the two Bobs" in Office Space). The other line is from Seinfeld, when Kramer is pretending to work at an office. I think I stole the coffee joke from Dilbert, but I'm not 100% sure on that one.